Three card readings are quite versatile for looking at any situation, but ideally, they should be targeted to one specific question or area of concern. Why? because there are only three cards, not enough to see extremely detailed patterns in regards to multiple areas. 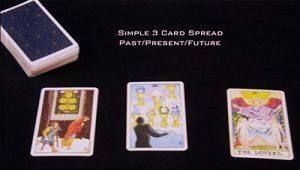 When focused, however, a three card reading is a great way to look at the flow of a situation from current energies to where things are likely headed based on the flow of events. This simple spread can give some insight and clarity and allow you to consider your path from a more well-rounded perspective. Would changes yield better results? Are you more reassured in the direction you are following? Where you are now and what surrounds your current situation, how you came to this place. Practical steps to help you make the most empowered choices in the present moment. This card highlights the “flow” of past/current energies and how they are transitioning forward. It is a great way to see the way things are headed, so that you can make adjustments or leave well enough alone. Please Include your name and email (if different than the one you are paying through with PayPal) Also, place any specific questions with your payment on the PayPal screen. There is a section on the PayPal payment screen where you can leave comments. If you don’t see it, contact me here. Please be sure that my email address Christin @ spiritualguidancetarot.com is on your SAFE list so that your reading gets to you. There is a wait of 3-5 business days on average because I do all readings with an actual deck of cards and not a software package. Quality takes time – but it’s worth it! **Please note a reading should never take longer than 1 week to receive. If it has, chances are the payment was lost or the email was filtered etc. Contact me directly and we’ll resolve it. If you have questions about readings and how they work feel free to Contact me ahead of time and ask.